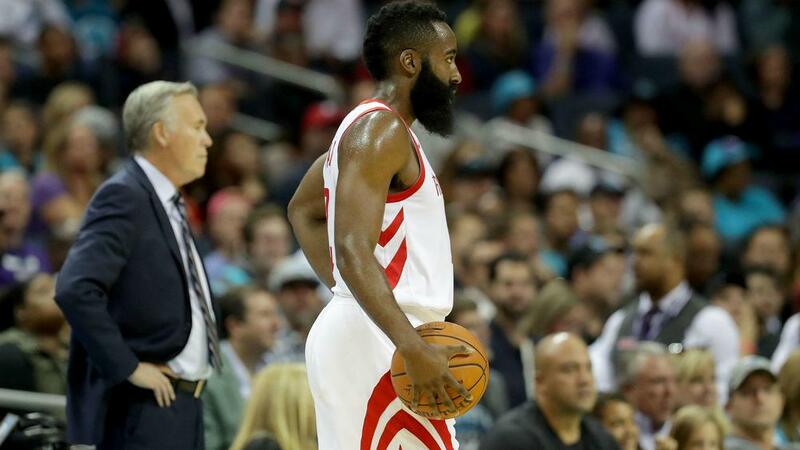 James Harden equalled several records during the Houston Rockets' NBA loss. Houston Rockets star James Harden tied multiple NBA records on Sunday. The 29-year-old tallied 38 points in the Rockets' 116-109 loss to the Magic in Orlando. It was Harden's 16th game scoring 30 or more points, which tied former Los Angeles Lakers star Kobe Bryant's record set during 2002-03. Harden, however, missed 16 of his 17 three-pointers in the loss. He tied Damon Stoudamire for the most missed three-pointers in a single game. It was also the worst three-point field-goal percentage in a single game in NBA history, with a minimum of 15 attempts. "The problem is you can't rely on [Harden] to be superhuman every night,'' Rockets coach Mike D'Antoni said, via ESPN. "We have to have some contribution from other guys. I thought they came in with a lack of focus on the defensive end, and it carried over on the offensive end. We didn't play well." Harden, the defending MVP, has been one of the best players in the NBA this season. He entered Sunday's matchup averaging 34.1 points, 8.7 assists and 6.1 rebounds per game in 2018-19. Harden is also shooting 43.8 per cent from the field and 39 per cent from three-point range. The loss to the Magic dropped Houston to 24-18 this season. They will host the Memphis Grizzlies on Monday.